I was looking at some images I took in Hawaii in January and picked one of those images for this week. 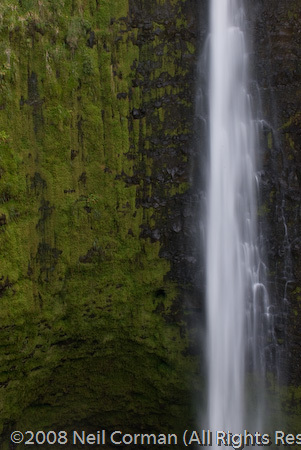 While photographing Akaka Falls, located about 20 minutes north of Hilo, the options to include the entire falls was a little more challenging since they are doing some construction on the path. Thus instead of trying to get the complete 442 foot falls in one picture, I pulled out my telephoto lens and looked at how a portion of the falls may look as the photograph. I took quite a few pictures doing this, and quickly found you lost the whole perspective of 442 feet. However in the following image by including part of the depression in the rock wall you start to get the perspective of size once again showing two images how two captures can tell a entirely different story. Yesterday afternoon over 97 million viewers in the United States watched the end of the 2007 football season in Super Bowl XLII (does the Pro Bowl really count? ), and what an exciting end it was this year. I think the only problem with the game was the decision of the MVP. The Giants defense is what kept them in the game and allowed Eli Manning to make the final drive for the win, followed by the defense shutting down the Patriots in the final 35 seconds completing the upset. With that said a defensive player should have been the Super Bowl MVP, as they kept Tom Brady pressured during the game and forced him to fumble ending a drive which could have led to points by New England in the second quarter changing the direction of the game. Speaking of fumbles, about a month ago while in Hawaii I had a fumble of my own. Of course my fumble was not directly tied to football, it instead involved a wide angle Nikon lens while hiking Kilauea Iki at Hawaii Volcanoes National Park. One morning I decided to wake up early and hike the trail down into the former lava lake. Everything was going well and as the sun started to rise the crater begun to slowly fill with light. 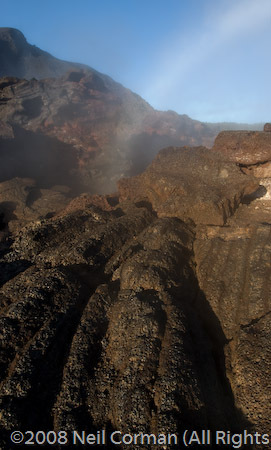 Standing alone on the warm surface was quite an experience, as it was almost fifty years ago this was filled with lava. As I started to take images of the surroundings I quickly was entranced with the place. That was until during a changing a lens my lens somehow decided itself to bow to the volcano goddess but went a little too far landing almost directly on the front element. The one saving grace of this event was the lens hood was attached and took a sizable amount of the impact. As the lens hood detached from the lens and went flying, I picked up the lens and noticed a gash in the front element in addition to the focus and zoom rings were no longer movable. Many things go through your mind at a time like this, but due to the nature of the accident I was quite well composed since there was not much I could do as the damage had been done. One of the challenges I had for the final five days photographing in Hawaii was the limitation I now had with the focal lengths available when composing images. Looking at the results I feel I was able to think of images I may not have previously taken forcing me to think differently. This event allowed me to learn the lesson of adaptability which will remain with me, in addition to being more careful with changing lenses and using the lens hood at all times. Upon returning home to Colorado, I took the lens to a repair shop not knowing how much it would cost to repair the Nikon 12-24mm lens. After receiving the estimate I was satisfied with the repair cost (it’s hard to be happy with the extra expense) and at this time it is in the process of being repaired. The start of the new year brought me to Hawaii, and the last morning I was on the North Shore of Oahu I made my way to Sunset Beach. The previous evening had provided a nice sunset and who know what the morning would bring. While the sunrise and sunsets were not textbook while I was on Oahu it did provide for some interesting opportunities. 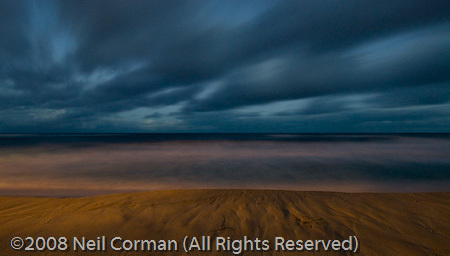 The image which would have been posted on January 6th consists of a quiet morning on Sunset Beach. While the scene seems quite tranquil there were some surfers nearby scouting the waves since the prior day has provided for some good surf. For the first part of January I have been traveling and with limited internet access, leaving me a little behind on posting. Anyways here is the image which would have been posted on December 30th. After leaving Denver on Christmas Day with seven inches of snow, a record for the day, I made it to San Diego for a few days. One morning I made it to Shelter Island where I found this sculpture. After trying to get a good angle I was able to come up with the following image. 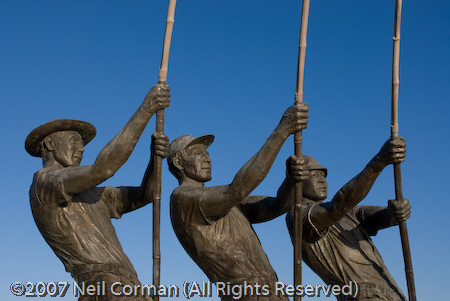 The sculpture itself is the Tunaman’s Memorial and is a symbol of courage of the fisherman who once operated out of San Diego Bay. 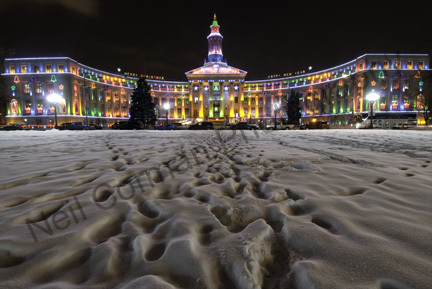 As the holiday time is here, I thought this would be the perfect time for an image taken at the Denver City and County building. Each year they light the building with lights, and this year they have changed to LED sources to help lower the energy usage of the display. While the display will be visible through the New Years, the building will be illuminated during the National Western Stock Show. The image selected for this week took me out Friday evening after some small snow falls during the week. As the skies started to clear, the temperatures dropped quite quickly while walking around the quite empty Civic Center Park. 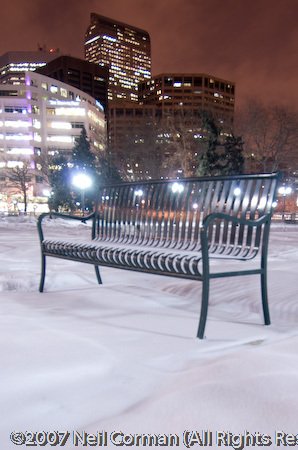 I noticed the following bench and then looked up at the lights of downtown, and tried to grab the quiet picture shown below. In addition to the cold avoiding the port-a-potty just to the left of the frame and other items made this a little bit of a challenge. After the thirty days project ended, I decided I would post an image each Sunday to provide an update of what I have been photographing in the past week. This past week in Denver we experience some extraordinary sunsets early in the week. On both evening I was fortunate enough to notice the clouds developing and grab my camera and head to an area near downtown. The image selected for this week was one of the last pictures taken on Tuesday evening. While pointing the camera towards downtown I was noticing the light rail was passing by and the possibility of an image. 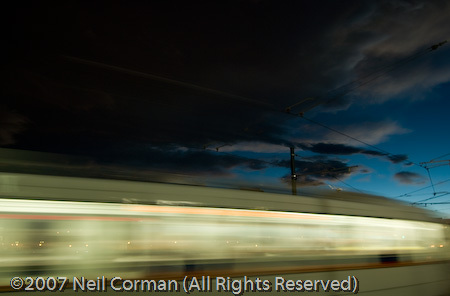 Just as I was wrapping up, it was time for a light rail to come by and with a quick metering grabbed the motion of the train as well as the last bit of effect in the sky from sunset. Here we are, Day 30. I was out looking for a skyline shot of Denver however with the storm moving into the mountains the afternoon light was not going to be too good today. 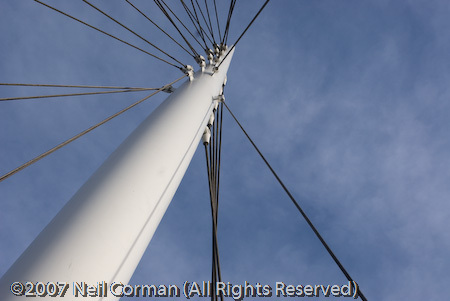 As I was standing on the 16th Avenue bridge leading to the Platte Valley I looked up and noticed the manner the post was against the blue sky and snapped off some images. Looking back on the thirty days, this is a good ending to the series since it shows us on Day 30 the sky is the limit. 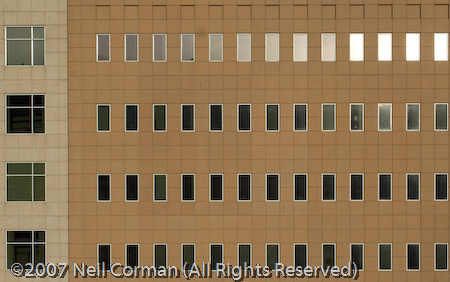 Sometimes called the Taj Mahal or one of the many other nicknames it is known, the image for today is the Jefferson County Administration Building located in Golden, Colorado. I am sure even people from out of the area have noticed this building when heading to the mountains to enjoy the skiing at Vail, Beaver Creek, Aspen or one of the many other ski areas near Interstate 70. The building has many architectural elements but the western side with the afternoon light and the many windows drew my attention today. It was just over five years ago when I spent almost a month serving jury duty here and noticed the details each morning when reporting, so as the thirty days nears a close Day 29 has been served. 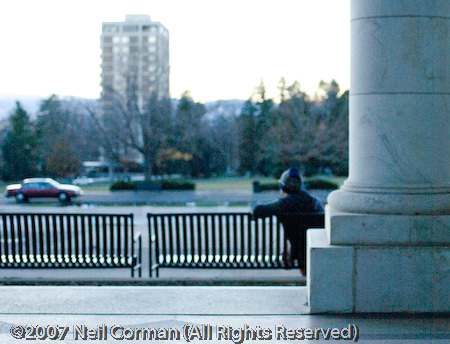 Was at Cheesman Park today taking some images right as the sun went behind the mountains. I thought I had some images which would be good, but upon looking at them after getting home I wasn’t too happy with the results. I started playing with a couple of them in Lightroom and on one got a little crazy with the adjustments which changed the picture dramatically. This provided a perspective which I thought would be good enough to pass the grain for Day 28.